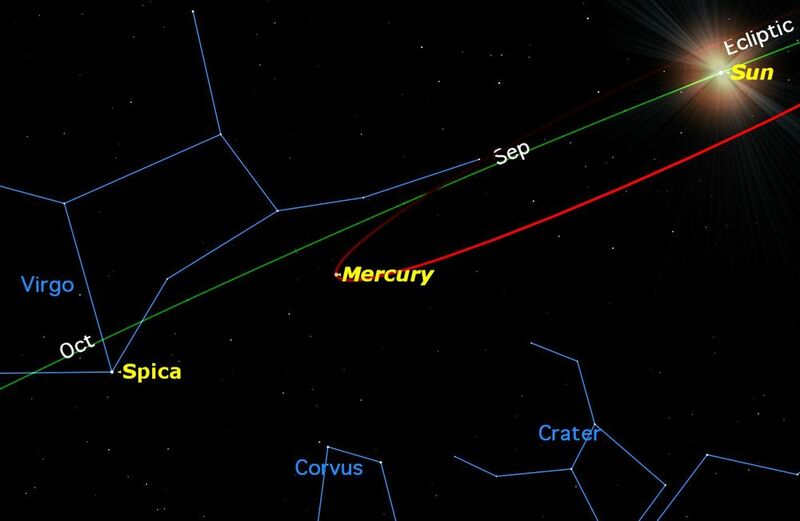 Mercury reaches its greatest elongation east of the sun this week on Friday, September 4. On Friday, September 4, Mercury will be at its greatest elongation east of the Sun. Credit: Starry Night software. Here we see it as we might from space, say on the International Space Station or the Hubble Space Telescope. The green line marks the ecliptic, the path the sun appears to follow over the year. Most of the planets also appear to revolve in this same plane. The red line is Mercury’s orbit, which you can see is tilted quite a bit compared to the ecliptic. Of all the planets, Mercury’s 7 degree tilt is the most extreme. The small orange dot marks Mercury’s position on Friday, as far east of the sun as it can go. How will Mercury look to us here on the surface of the Earth? It very much depends on where you are located. As seen from Europe and North America, the ecliptic makes a shallow angle with the horizon, so Mercury is not well placed. Credit: Starry Night software. This view of Mercury is how it will appear to me from my location close to Toronto, Canada at sunset. Everyone at a similar latitude across southern Canada, the northern United States, and most of Europe and Asia will see something very similar. Because of the Earth’s current position in its orbit around the sun, the ecliptic makes a very shallow angle with the western horizon as seen from the northern hemisphere. So even though Mercury is as far west of the sun as it can get, at this time of year it ends up very close to the horizon around sunset, the best time to look for it. To make matters worse, because of its orbit’s tilt, Mercury is quite far south of the ecliptic at this time. As a result Mercury is barely 7 degrees above the horizon at sunset. The situation in the southern hemisphere, here seen from southern Australia, is very different. The ecliptic makes a very steep angle with the horizon, and Mercury is south of the ecliptic, so Mercury is much higher above the horizon at sunset, 26 degrees in fact. 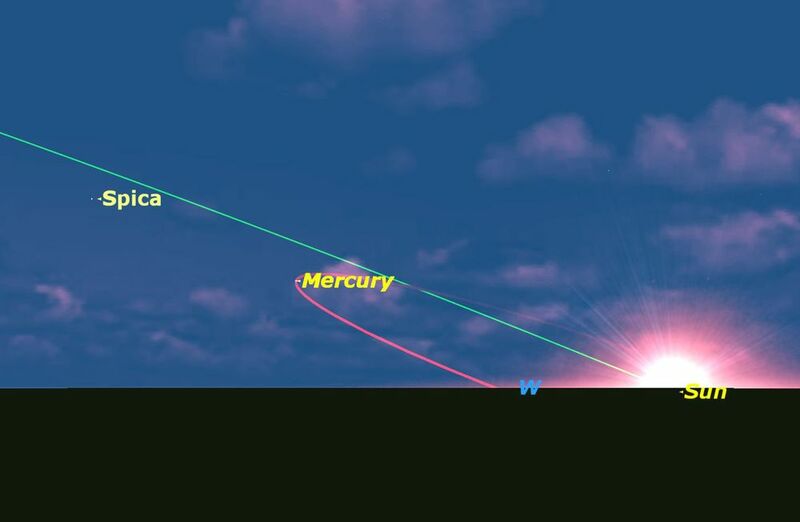 As seen from Australia and South Africa, the ecliptic makes a steep angle with the horizon, so Mercury is very well placed. Credit: Starry Night software. As a result, spotting Mercury from the northern hemisphere will be a major challenge this week, but the lucky people in the southern hemisphere will have a fine view. This situation reverses in the spring, when northerners get a fine view of Mercury at dusk, and southerners are out of luck. It also reverses when Mercury is at elongation on the western side of the sun. That is why every year we publish a table showing which elongations of Mercury will be favorable or unfavorable, depending on which hemisphere you view it from. All in all, even though it is very bright, Mercury is probably the most challenging planet to view. You have to be in the right place at the right time. Mercury viewed through a telescope is a disappointment. The most you will see is a tiny disk, which goes through phases similar to Venus and the moon. But it is a great satisfaction to most stargazers to say that they have actually seen it at all. Mercury is always a difficult object to spot, always clinging closely to the sun’s apron strings. But you might be excused for missing its brief appearance this week in the dawn skies. After many attempts to observe Mercury, I’ve found that the best time to spot it is about half an hour before sunrise in the morning sky, or half an hour after sunset in the evening sky. It’s always a balancing act between Mercury’s low altitude and the brightness of the background sky. I find 7x50 or 10x50 binoculars helpful in spotting Mercury, though once I’ve located Mercury in binoculars I usually have no trouble seeing it naked eye. Unless you’re paying close attention to the sky, you’re likely to miss the current apparition of Mercury. In the northern hemisphere, Mercury can be seen half an hour before sunrise. Credit: Starry Night Software. Because of the tilt of the ecliptic, the path the Sun and planets follow across the sky, some apparitions of Mercury are more favorable than others. Usually apparitions which are favorable for observers in the northern hemisphere are unfavorable for observers in the southern hemisphere, and vice versa. The tilt of the ecliptic would indicate that this apparition favors southern observers, but as you can see from these two views, it really isn’t much different: catching Mercury this week will be a challenge for observers everywhere in the world. A secondary factor affecting Mercury’s visibility is the tilt and eccentricity of its orbit. At 7 degrees, Mercury’s tilt is greater than any other planet. The eccentricity of its orbit, which measures how far it deviates from a circle, is also the greatest, more than twice as eccentric as Mars’ orbit. The tilt this week also favors southern observers, as you can see in the charts, where Mercury’s orbit is marked in red and the ecliptic in green, but even this doesn’t help much. The view is not much better in the southern hemisphere. Credit: Starry Night software. If you are successful in spotting Mercury in the next few days, congratulate yourself, and let us know here! Now that Pluto has been demoted to a dwarf planet, Mercury is the smallest of the eight planets. With a diameter of 3032 miles (4879 km. ), it is slightly more than a third of the diameter of Earth, and smaller than the solar system’s two largest moons, Ganymede and Titan. Because of its tight orbit around the sun, Mercury never strays far into the night sky, peeping tantalizingly over the horizon a few times a year. 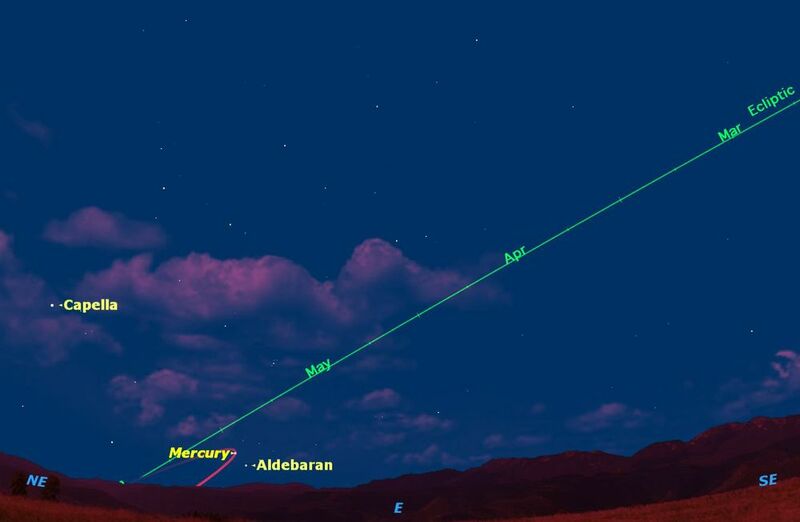 The next two weeks will be your best chance for seeing Mercury in evening twilight this year. Timing is the secret for catching sight of Mercury. Try too early, and its tiny speck of light will be lost against the twilight sky. Try too late, and Mercury will be too close to the horizon. I’ve found the best time to be about half an hour after sunset. Binoculars are helpful in initially spotting Mercury, but once located in binoculars you should be able to see it with the unaided eye. Currently Venus is shining brightly in the evening sky, and it can be a helpful guide to spotting Mercury, about two-thirds of the way down towards the horizon, and slightly to your right. Don’t confuse it with nearby Aldebaran, which will have a noticeably reddish color and will probably twinkle, while Mercury shines with a more steady light. On the evening of Thursday, May 7, Mercury will be at its farthest from the Sun, making the next two weeks the best time this year for observers in the northern hemisphere to spot this elusive little planet. Credit: Starry Night software. In a telescope, Mercury is a disappointing sight. Like Venus, Mercury exhibits phases as it passes between us and the sun. At present it is slightly gibbous. On Saturday, May 2, it will look just like a miniature first quarter moon. After that, it will assume a crescent shape. Because Mercury is always seen close to the horizon, it is a challenge to see its surface markings, even in a powerful telescope. Serious observers of Mercury prefer to observe it in the daytime sky, now relatively easy to do because of computerized telescopes. But always be very careful when observing with the sun above the horizon, because even the briefest view of the sun in a telescope will do permanent harm to your eyes.